International exams: Why do we think they are so important? And are we right? Download the complete paper on Israeli students and international exams. In Israel, it is customary to attribute the utmost importance to achievements in international education exams. A new study by Taub Center principal researcher, Nachum Blass, claims that the preoccupation with the results of these tests is disproportionate. The research examines a large number of indices that influence the educational attainments of Israel relative to the OECD countries, and points out that, given the resources that are invested and the conditions under which the education system in Israel operates, there is no reason to expect higher achievements on international exams. In addition, the study shows that high achievements on these tests do not necessarily predict a better economic future for the country. The expenditure per pupil in Israeli preschools is about 13% of the per capita GDP, as opposed to an average of 21% in the OECD. The respective expenditures in upper secondary education are 19% versus 26%, and only in primary school education are expenditures in Israel similar to those in the OECD: 23% of GDP per capita. There is no proven link between a country’s past educational achievements and its current economic functioning. Thus, for example, the correlation between the achievements of a country’s pupils on the SIMS exam in 1985 and the per capita GDP measured in 2010 was negative and close to zero (-0.09). Despite Israel’s low ranking on international tests, Israelis have registered more patents than graduates from countries whose students performed better – a finding that gives testimony to inventiveness and success in international markets. Israel ranks third worldwide in the number of patents per billion dollars of GDP. The subject of pupil achievement on international exams in Israel has preoccupied the Ministry of Education for many years, and, from time to time, even creates a storm – as happened when a large improvement in scores on the 2011 tests caused some to question its validity. A new study by Principal Researcher Nachum Blass of the Taub Center for Social Policy Studies in Israel comes out against what he terms the excessive obsession with the results of these tests. Blass compares Israel with 8 OECD countries (that were chosen on account of their full participation in the international tests or on account of interesting developments in their education systems) and reaches two conclusions: 1) Israel’s investment in education is low relative to the developed OECD countries, and, therefore, one should not expect the results in Israel to be higher than in other countries; 2) a high ranking of pupil achievement on international tests is not correlated with higher future socio-economic indices in those countries. Blass claims in his research that the expectation of better outcomes in international exams is, at its core, based on national pride and myths such as being “the people of the book,” while, in practice, the variables that are known to impact pupil achievement do not give Israel an advantage over other countries and, at times, quite the opposite. Israelis are better educated than in the OECD, but the gap is closing: The share of higher education graduates in the overall population in Israel, and especially among the Jewish population, is high relative to most of the OECD countries as well as to the OECD average. However, this advantage is decreasing substantially among Israelis aged 30-34. This shows that the advantage Israeli children receive from their parents’ levels of education still exists, though it is lessening. Teacher salaries in Israel are low relative to the OECD: Salary is one of the most important factors in attracting and retaining high-quality teachers. 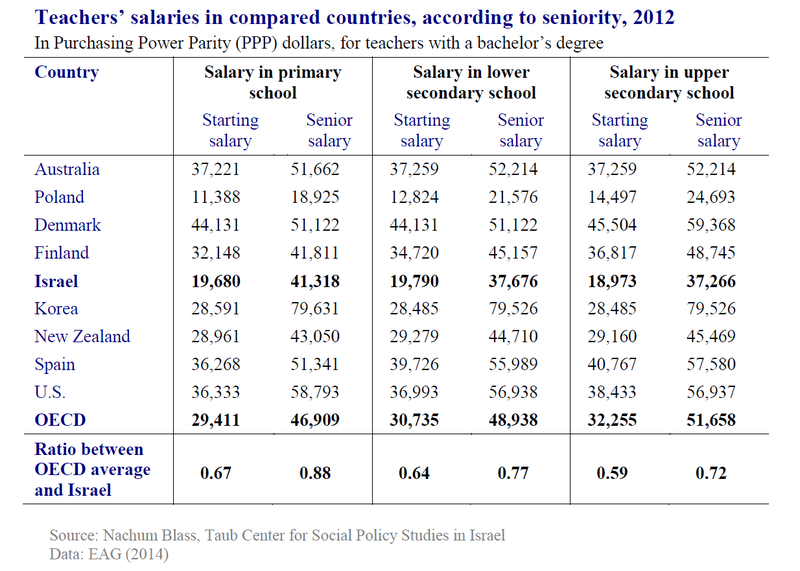 The starting salaries of teachers in Israel are very low on international scales (although they increase with seniority). In 2012, an unexperienced primary school teacher with a BA degree in Israel earned about 67% of the average salary of a teacher with similar characteristics in the OECD, but with seniority the percentage rose to 88%. In lower secondary schools, the statistics are 59% and 72%, respectively. Comparing teacher salaries with the salaries of workers with academic degrees in other professions, we see that a primary school teacher in Israel earns 87% of the average salary of an academically-educated worker in other professions, as opposed to a ratio of 85% on average in the OECD. In lower secondary schools, the ratio is 85% in Israel and 88% on average in the OECD. In upper secondary school, Israel has a ratio of 88%, versus an average in the OECD of 92%. In Israel, the per pupil budget relative to GDP is low in comparison to the OECD: An additional criterion for examining Israel’s situation is the portion of the total budget allocated to education; on this measure, too, Israel lags behind. In 2011, the expenditure per preschool pupil relative to per capita GDP stood at 13%, versus 21% in the OECD. At the upper secondary school level, the expenditure per pupil was 19% versus 26% on average in the OECD. Only at the primary school level does Israel have a ratio that is similar to the OECD average – 23% (It should be noted that one reason for the difference in allocations is that the share of children in Israel’s population is much higher than in the OECD, and closing this gap would require considerable resources). According to Blass, another reason the scores on the international tests should not be given so much weight is that the relationship between success on these tests and either the quality of the education system or the middle or long-term economic performance of the country has yet to be proven. For example, in 2010 the correlation between the achievements of countries whose students took the 1985 SIMS test and the two indices of GDP in those countries – per capita and per hour worked – is negative and close to zero (-0.09 and -0.05, respectively). The results show that even if there is a correlation between knowledge and scholastic achievement and socioeconomic indices, the results of the international tests do not necessarily reflect the level of knowledge, and the knowledge conveyed through the education system is just one of many components that affect the economy. According to Blass, “although the education system in Israel is not counted among the world’s best in terms of international test scores, and despite all of its problems, the achievements of Israeli society in the fields of economics, culture and science indicate that it can be proud of the results.” As evidence, he presents the number of patents that graduates of Israel’s education system have registered relative to the number in other countries, which testifies to the originality and creativity of graduates of the education system. In 2008, Israel was ranked third in the world for the number of patents per billion dollars of GDP, and showed a large lead over those countries whose pupils scored higher on the 1985 tests. In the US, for example, whose SIMS score in 1985 was higher than Israel’s by a point and a half (51.4 versus 49.9), only 1.12 patents per billion dollars of GDP were registered in 2008, while in Israel the number was 2.58. The ratio for the Netherlands, whose SIMS score in 1985 was higher than Israel’s by 10 points, was only 1.72. The Taub Center for Social Policy Studies in Israel, headed by Prof. Avi Weiss, is an independent, non-partisan institution for socioeconomic research based in Jerusalem. The Center provides decision makers, as well as the public in general, with a big picture perspective on economic and social areas. The Center’s interdisciplinary Policy Programs – comprising leading academic and policy making experts – as well as the Center’s professional staff conduct research and provide policy recommendations in the key socioeconomic issues confronting the State. For details, or to arrange an interview, please contact Itay Matityahu, Director of Marketing and Communications 052-290-4678.